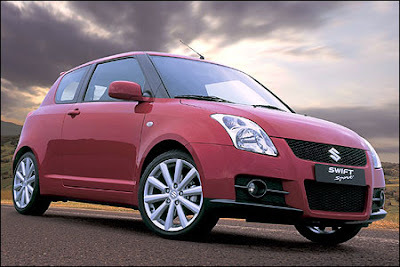 A 2011 Suzuki Swift test mule has been spied! (Above is the current Swift.) A bunch of photos can be found at The Motor Report. According to the Australian site, the car is scheduled to debut at the 2010 Paris Motor Show in October. Of course the big question on my mind (and many others') is will it show in the U.S.? Uhm. Another five-door hatch? Looks like that in the pics. The Swift I wanted was a three-door. Will the Accent SE be the only hatch in North America, besides the Mini, with three doors? Maybe a three door will be offered later. Maybe a three-door Fiesta will be offered later too. And maybe not, since the perception exists that Amercians won't buy three-door hatches. Also, it says it's larger......not a plus for handling.